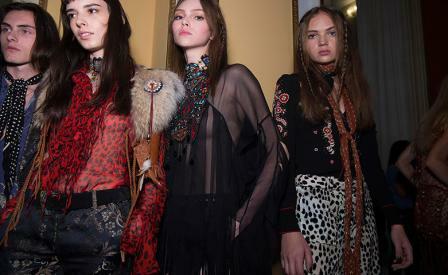 Mood board: With Milan’s extravagant Palazzo Spinola draped in swaths of colourfully printed heavy sheets, it was clear that Peter Dundas had conjured an exotic harem for his adventure-loving Cavalli girls. Dundas called his fringe-trimmed, crystal crusted gang ‘pagan travellers’, and with this much carnal flesh on view and this many curves carved out of his skintight clothing, this collection was indeed an opulent feast for the eyes and soul. Best in show: Though he loves a flared-leg skintight trouser, and sharp cropped jacket combos – not to mention a va-va-voom sheer string of jewels serving as an evening gown, Dundas’ best work has always been and continues to be the boho dress. This season, he crafted wonderful peasant skirts from flounced tiers of patchworked fil coupes and a positively smashing dress made from dégradé layers of pink to dark purple. Finishing touches: The 1970s are this designer’s preferred – if not only – era of reference. Wooden clogs, massive platforms, artisan jewelry and yards of fringe hanging off of decadent shawls all cried hippie in the middle of his exotic sojourn.